With south-easterlies well established today saw the sea come in for marathon coverage and there were decent rewards, with the Bill returning totals of 452 Common Scoter, 117 Little Gulls (the highest ever spring day total at the Bill), 68 Sandwich Terns, 22 Red-throated Divers, 6 Arctic Skuas, 5 Brent Geese, 5 Eider, 4 Shelducks, 4 Common Terns, 2 Great Crested Grebes and at least 1 lingering Iceland Gull. Another 4 Little Gulls passed through Portland Harbour, where singles of Black-throated Diver, Great Northern Diver and Red-necked Grebe remained; the long-staying Iceland Gull also continued to roam about the harbour/Ferrybridge/Chesil Cove area. The land was very much the poor relation: there were a few new arrivals but numbers, variety and quality left a lot to be desired, with a Brambling and the lingering Firecrest at the Obs, a Redwing at Barleycrates Lane and a spread of at least 3 White Wagtails being the only minor oddities on offer. With the light south-easterly not having the keen edge it had yesterday it was a really pleasant day to be birding the island, even if the sad lack of grounded arrivals made for some uneventful trudging. It really was extremely quiet on the ground, with 2 Purple Sandpipers and singles of Merlin, White Wagtail, Black Redstart and Firecrest providing the only interest at the Bill over and above the lightest sprinkle of Chiffchaffs. Visible passage was concentrated along West Cliffs, where sample counts came up with 170 Linnets in 15 minutes and 110 Meadow Pipits, 58 Sand Martins, 47 Linnets and a Skylark in an hour a little later on. Sea passage was never very strong, but a good deal of watching eventually returned totals that included 116 Black-headed Gulls, 100 Common Scoter, 15 Brent Geese, 15 Little Gulls and 8 Red-throated Divers through off Chesil and 7 Red-throated Divers, 2 Arctic Skuas and a Great Northern Diver through off the Bill, where the Iceland Gull was again lingering offshore. Under clear skies and with a freshening south-easterly the sea was always going to be in with a shout for a bit of variety - and so it came to pass. A small passage of Little Gulls was a surprise for so early in the season, with 23 off the Bill, 19 off Chesil and a singleton lingering at Ferrybridge, but further interest came in the form of 100 Common Scoter, 97 Black-headed Gulls, 26 Sandwich Terns, 2 Red-throated Divers, 2 Dunlin, an Arctic Skua and the Iceland Gull off Chesil, and 67 Common Scoter, 17 Sandwich Terns, 4 Red-throated Divers, 2 Red-breasted Mergansers and singles of Pintail, Grey Plover and Arctic Skua off the Bill; an Iceland Gull - likely yesterday's Bill bird, and seemingly not the Chesil individual - was also off East Cliffs near Southwell. The land didn't disgrace itself, with a fair scatter of arrivals around the Bill in particular. The first Redstart of the spring was at Southwell and a Ring Ouzel showed up at Tout Quarry but the numbers were further south, with 75 Chiffchaffs, 40 Wheatears, 10 Blackcaps, 5 Willow Warblers and singles of Black Redstart and Firecrest at the Bill; visible passage wasn't properly censused but overflying Meadow Pipits were conspicuous and a few hirundines were tagging along. 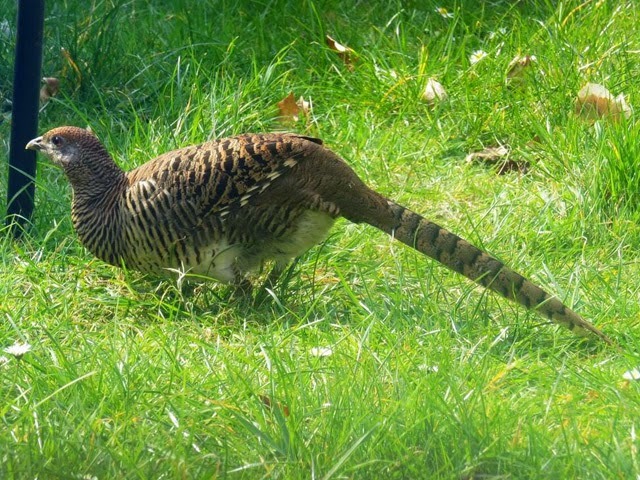 ...we know next to nothing about dodgy pheasants, but this bird - which has been frequenting private gardens at Easton for the last fortnight - looks from the unbarred belly and other features to be a fair bet for a Lady Amherst's Pheasant. We don't know who keeps dumping all these dubious gamebirds around the island, but a few Lady A's would be a welcome replacement for the Common Pheasants whose few years of residence looks now to have fizzled out. The morning's mix of bright spells punctuated by heavy showers arriving in from the south-east wasn't that dissimilar to yesterday's conditions but there were far fewer migrants both on the ground and overhead. Wheatear and Chiffchaff again dominated on the ground, although topped just 40 and 20 respectively at the Bill; a lone Black Redstart was the only very minor oddity there. In contrast, the sea was a good deal more productive than it had been yesterday: Chesil Cove came up with a good movement of 240 Black-headed Gulls, together with 3 Canada Geese, 3 Sandwich Terns, a Curlew and the Iceland Gull, whilst 2 Red-throated Divers and singles of Great Northern Diver, Manx Shearwater, Grey Plover, Arctic Skua, Little Gull and Iceland Gull passed through off the Bill. Just a reminder that the next In Focus field event at the Obs takes place between 10am and 4pm tomorrow, Saturday 29th March. Despite what must have amounted to the most trying of conditions - including frequent showers of rain, hail and sheet - there was a palpable sense of urgency about the morning's arrivals at the Bill, with few touching down for long, and many flying straight through. So rapid was the dawn departure that there was no time for a proper census beyond estimates of 100 each of Wheatear and Chiffchaff; a few Blackcaps and Willow Warblers also touched down briefly, along with a single Ring Ouzel. Before long visible passage begun in earnest, with the sample totals of 1800 Meadow Pipits, 50 Linnets, 9 Sand Martins and singles of Grey Heron, Merlin, Grey Wagtail and Bullfinch accrued in quick time certainly reflecting the volume of passage taking place. 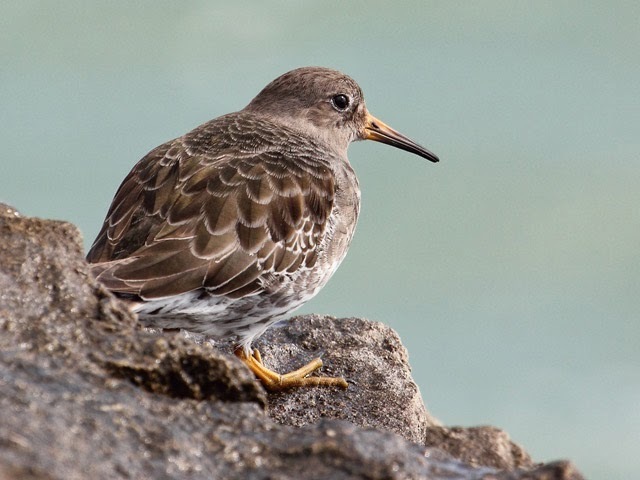 Although a few late-comers continued to trickle in, the bulk of passage fizzled out in improving conditions through the middle of the day and the only later interest came in the form of a lone Arctic Skua passing through on the sea. Not before time there was a much more positive vibe to events today, with the first decent little drop of grounded migrants at the Bill. Totals of 75 each of Wheatear and Chiffchaff made up the bulk of the numbers, but variety/quality came in the form of 5 each of Blackcap and Willow Warbler, 2 Ring Ouzels and singles of Common Sandpiper, Black Redstart, Goldcrest and Firecrest; sadly, new arrivals were in short supply elsewhere, although the Iceland Gull continued to entertain on its frequent visits to Ferrybridge. In a light north-easterly the sea promised more than it delivered: a passing Long-tailed Duck was the pick of the bunch off the Bill, where 3 Red-throated Divers, 2 Manx Shearwaters and 2 Common Scoter were just about the only other migrants logged. 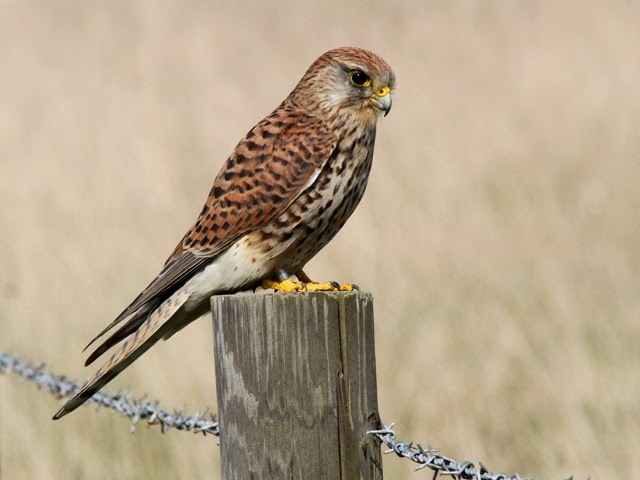 In terms of numbers and variety on the ground it remained extremely quiet, although there was more than a suggestion from events overhead that migrants were on the move in some quantity - perhaps the nocturnal arrivals are just going straight over? At the Bill the total of 20 Wheatears represented the only numbers on the ground; Chiffchaffs were almost non-existent, Blackcaps limited to a single at Southwell and 2 Black Redstarts, a White Wagtail and a Firecrest constituted the rather sorry tally of oddities. Overhead it was a different story, with the sample one hour count of 224 Meadow Pipits, 7 Linnets, 6 Pied Wagtails, 6 Greenfinches, 4 Sand Martins and 2 Skylarks heading north along West Cliffs being representative of the steady passage going on throughout the morning; a Red Kite that appeared over Suckthumb Quarry may well also have been a migrant as opposed to a wanderer from the mainland. The sea came up with little more than 2 Red-throated Divers through off the Bill, although both the Black Guillemot and Iceland Gull remained at Portland Harbour and Chesil Cove/Ferrybridge respectively. 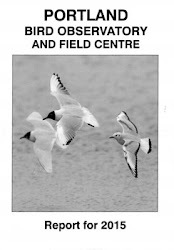 Finally, a reminder that the next In Focus field event at the Obs takes place between 10am and 4pm this Saturday, 29th March. In an ever-freshening south-easterly ahead of rain that finally arrived late in the afternoon there were again pitiful numbers of grounded migrants: a Black Redstart was amongst the handful of Wheatears scattered at the Bill, where a single Firecrest was the only new bird ringed at the Obs; overhead, incoming alba wagtails were conspicuous, with a lone Crossbill also passing over at the Bill. Sea passage was steady but hardly spectacular: the first 2 commic terns of the spring and the Iceland Gull lingered off Chesil Cove, where 3 Shelduck, a Sandwich Tern and a Puffin also passed by, whilst 17 Black-headed Gulls, 7 Sandwich Terns, 3 Shelduck, 2 Great Northern Divers and singles of Red-throated Diver and Arctic Skua passed through off the Bill; one of the Black Guillemots was still in Portland Harbour. Despite what would for incoming migrants have been a brisk and chilly headwind - the sort of conditions we sometimes do quite well on - there were few signs of passage getting going in any worthwhile quantity: 3 White Wagtails at the Bill and 3 Siskins at Avalanche Road were noteworthy new arrivals but the likes of Wheatears and Chiffchaffs hardly featured. Two Black Redstarts remained at the Bill, the Iceland Gull was again at Chesil Cove/Ferrybridge and 2 Black Guillemots were off Portland Castle (...is it a new second individual or a reappearance of the bird last seen more than three weeks ago?). Seawatching at the Bill came up with 3 Manx Shearwaters, 2 Red-throated Divers and a Great Northern Diver. Although not quite a grim as we'd been expecting, the weather certainly has taken a turn for the worse with a cold north-westerly and occasional hail showers the order of the day. Migrant activity was very subdued, with a Little Ringed Plover that pitched in briefly at Ferrybridge easily the highlight; at least 2 Black Redstarts remained at the Bill but there was precious little else of note amongst the thinnest of spreads of Wheatears and Chiffchaffs. The Iceland Gull was again at Ferrybridge/Chesil Cove and 5 Red-throated Divers passed through off the Bill. On a bright but distinctly chillier morning a Hoopoe was a nice find at Wakeham, where it remained for a few hours at least. 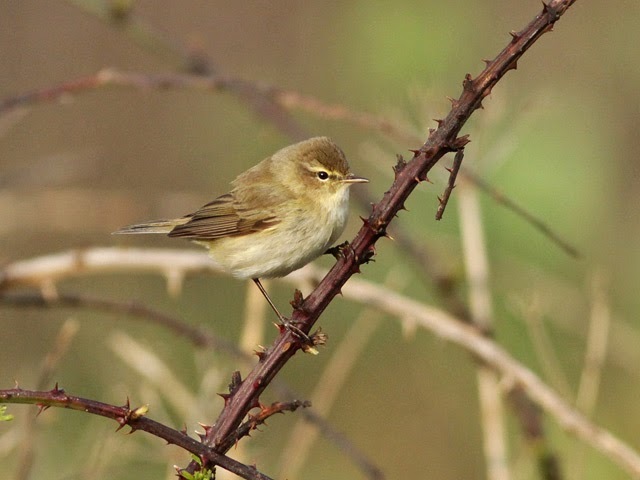 A few new commoner migrants were also in evidence, with 2 extra Black Redstarts joining the long-stayer at the Bill, an Oystercatcher arriving in/off at the Bill, a Water Rail new in at the Obs, the first Blackcap of the spring at Southwell, a Goldcrest at Wakeham and a thin spread of Wheatears and Chiffchaffs everywhere. Lingerers still about included the Iceland Gull at Chesil Cove and the Black Guillemot at the Bill, whilst seawatching came up with 2 Red-throated Divers through off the Bill. With it having been a really dry month at Portland it came as quite a surprise to be on the receiving end of gathering cloud, a freshening wind and, towards dusk, a decent dose of rain. The conditions perked up seawatching a little, with 25 Common Scoter, 12 Red-throated Divers, 2 Manx Shearwaters, and singles of Black-throated Diver, Arctic Skua and Sandwich Tern through off the Bill and 8 Red-throated Divers through off Chesil Cove; what was presumably one of lingering Iceland Gulls was also about again off the Cove. A light scatter of Wheatears constituted the only numbers on the migrant front, although singles of Black Redstart at Verne Common, Firecrest at Southwell and White Wagtail at the Bill did provide some extra interest. 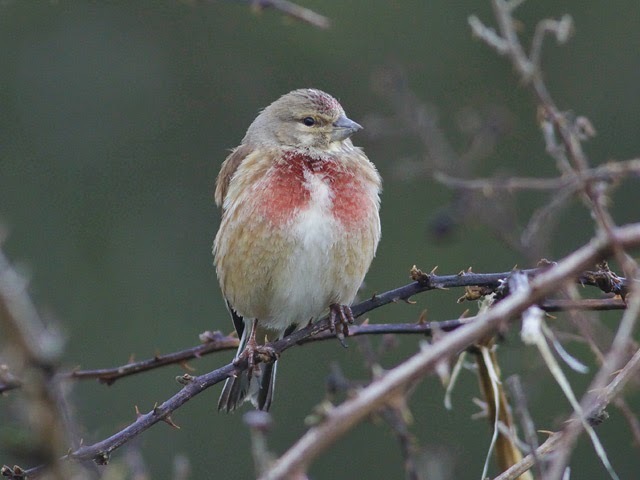 A freshening westerly ensured that the day was nowhere near as balmy as had been forecast, whilst overnight clear skies saw to it that the grounded migrant tally remained pegged right back. Visible passage did continue to feature, with the first 2 Swallows of the spring (at Barleycrates Lane) of note amongst the steady arrival of Meadow Pipits, but on the ground there was only a Black Redstart at the Bill and a Grey Wagtail at Southwell to provide interest amongst the very thin spread of Wheatears and Chiffchaffs. The sea fared no better, with just 3 Red-throated Divers and a lone Sandwich Tern off the Bill. Low-key again today. Seawatching at the Bill came up with 8 Red-throated Divers, a Great Skua and a Sandwich Tern, whilst grounded arrivals there consisted of a handful of Wheatears and Chiffchaffs, together with the long-staying Black Redstart. The only other report was of the Black Guillemot still in Portland Harbour. Both land and sea came up with a little passage on a quiet, mainly overcast day. Up-Channel movement off the Bill included 10 Red-throated Divers, 8 Common Scoter, 3 Black-throated Divers and a Great Northern Diver. Two Firecrests were the pick of the light smattering of new arrivals on the ground at the Bill, where odds and ends coming in/off included 2 Skylarks and a Reed Bunting. The day's rather glorious unbroken sunshine wasn't at all conducive to dropping migrants in any quanity although there was a steady passage overhead. The less mentioned about the land the better: a Red-legged Partridge was an unexpected turn-up at the Bill (although it was actually first heard calling the day before yesterday), but the handful of migrants there included nothing better than a single Black Redstart; it was much busier overhead, with the first 3 Sand Martins of the spring mingled amongst the steady stream of incoming Meadow Pipits and alba wagtails. Seawatching at the Bill came up with singles of Red-throated Diver, Black-throated Diver, Great Northern Diver, Brent Goose and Iceland Gull, and one of the Black Guillemots was again in Portland Harbour. With the notable exception of perhaps the most showy Red Kite ever to visit Portland, that spent more than an hour roaming around the Bill before heading off to the north, today's tally of new arrivals was particularly meagre. The handful of other migrants at the Bill included little more than 7 Wheatears, 5 Fieldfares, 2 Chiffchaffs and a Redwing, with 4 Red-throated Divers and a Black-throated Diver all that could be mustered from the sea. Elsewhere the Iceland Gull remained at Ferrybridge. The murky conditions we mentioned yesterday eventually made it to Portland and the island was fog-bound for much of the day. The evidence seemed to suggest that the other side of the Channel was clear, since migrants were trickling in throughout the day. Three early House Martins were of particular note at the Bill, where 30 Chiffchaffs, 6 Wheatears, 6 Redwings, a presumed migrant Common Buzzard and a Black Redstart all made the list and there were some decent-sized gatherings of grounded Meadow Pipits by the afternoon; 6 more Redwings and 2 Grey Wagtails were at Southwell. The only other report was of the Iceland Gull still at Ferrybridge. With Portland missing out on the murky conditions evidently widespread over the mainland, fieldwork was a pleasure on another remarkably balmy day. The day's chief rewards were fly-bys: a Marsh Harrier over the Bill shortly after dawn and a Little Ringed Plover heading north along West Cliffs later in the morning. A steady trickle of incoming Meadow Pipits and alba wagtails were again evident, whilst grounded arrivals included 20 Wheatears, 15 Chiffchaffs and 2 Redwings at the Bill; singles of Black Redstart and Firecrest at the Bill and Black Redstart at Reap Lane lingered on from previous days, whilst the Iceland Gull was again at Ferrybridge. The sea was again very quiet, with 15 passing Brent Geese the only worthwhile sighting from the Bill. It's a bit of a bad job when the birds of the day are 3 Canada Geese over the Bill, but beggars can't be choosers and in the absence of a Great Spotted Cuckoo they'll have to do. Migrant-wise, the clearance of yesterday's cloud saw northbound passage of Meadow Pipits return to the fore, with a well into four-figure total logged through the day; overflying alba wagtails also numbered several dozen. On the ground there was nothing in quantity but amongst the expected fare 2 Black Redstart and a White Wagtail at Reap Lane, another Black Redstart at Southwell, a Fieldfare at Barelycrates Lane and 2 Firecrests, a Redwing and a Black Redstart at the Bill were all of note. Amongst the long-stayers, the Black Guillemot in Portland Harbour and Iceland Gull at Ferrybridge both made the list. The only report from the sea was of 2 Red-throated Divers through off the Bill. The return of a complete cloud cover - coupled with the continuing brisk north-easterly - saw the temperature take a tumble. The make up of the day's migrant miscellany also had a chilly feel, with a Woodcock at Suckthumb Quarry and winter thrushes featuring in their highest numbers so far this year, including single figure totals of Redwings at several sites between the Bill and Barleycrates Lane, and 2 Fieldfares at Suckthumb Quarry; other new arrivals included 2 Chiffchaffs and singles of Goldcrest and Firecrest at the Bill and a Black Redstart at Southwell. One of the Iceland Gulls showed up again along the Beach Road, whilst seawatching at the Bill came up with 38 Common Scoter, 10 Red-throated Divers, 4 Shelduck and singles of Black-throated Diver, Great Northern Diver and Brent Goose. As might be expected in such fair weather grounded arrivals certainly weren't numerous but the ever increasing volume of visible passage is providing ample indication of spring really kicking off. 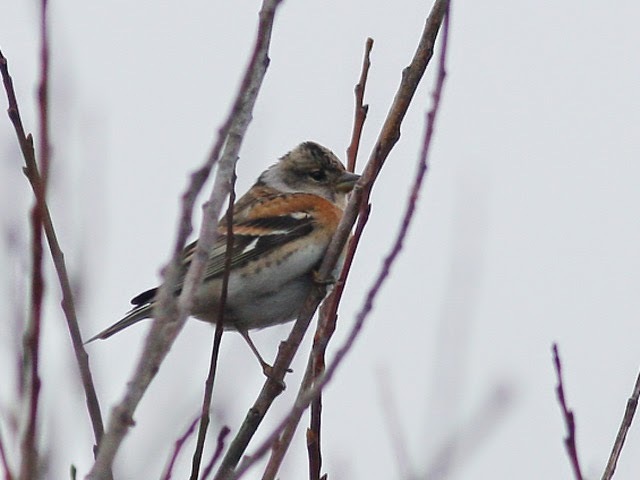 The numbers were all overhead, with a good 500 Meadow Pipits and 100 alba wagtails through over the Bill, where 5 Reed Buntings and a Brambling were also of note; a Redpoll through at Reap Lane was an addition from elsewhere. On the ground, 2 White Wagtails, a Black Redstart and a Firecrest at the Bill and another Black Redstart at Reap Lane were the best amongst a very thin spread of other expected fare. With the breeze having shifted toward an offshore north-easterly the only sea reports were of 3 Red-throated Divers and a Black-throated Diver through off the Bill. With high pressure beginning to get well established there was little hope of a dawn fall but plenty of expectation of later arrivals and some seawatching. Having being disappointingly absent thus far, it certainly wasn't a surprise that the first 2 Wheatears - singles at both the Bill and Ferrybridge - put in an appearance, whilst other interest on the land came in the form of 7 Golden Plovers and a Redwing grounded at the Bill and a constant light trickle of northbound Meadow Pipits and alba wagtails everywhere; a Common Buzzard also looked to have arrived in/off at the Bill. Amongst a light passage of commoner gulls the sea also came up with 4 Sandwich Terns, 3 Curlew, 2 Red-throated Divers and a Great Northern Diver through off the Bill, 3 Great Crested Grebes settled offshore there and 2 Red-throated Divers, 2 Shelduck and a Pintail through off Chesil; at least 2 Iceland Gulls were again roaming around between Ferrybridge and Chesil Cove, and one of the Red-necked Grebes was still in Portland Harbour. The chill and damp of a hazy dawn quickly gave way to unbroken warm sunshine. With a brisk south-easterly breeze blowing through the morning there was some movement at sea, with 2 Mallards and a Little Gull - together with fair numbers of commoner gulls - through off Chesil and 20 Common Scoter, 14 Shoveler, 4 Red-throated Divers, 4 Curlews and a Mallard through off the Bill. Overhead passage consisted largely of Meadow Pipits trickling north, whilst a White Wagtail at the Bill was the best of the grounded arrivals. Points northward came up with an Iceland Gull at Ferrybridge/Chesil Beach, a Slavonian Grebe settled off Chesil and 11 Slavonian Grebes, 4 Red-necked Grebes, a Tufted Duck and a Black Guillemot in Portland Harbour. An overcast and occasionally damp dawn was maybe a shade disappointing in not dropping a few thrushes, but once skies cleared there were visible migrants on the move even if precious little showed up on the ground. In terms of quality it was the singles of Iceland Gull and Kumlien's Gull off Chesil Cove in the morning and Iceland Gull through off the Bill during the afternoon that stole the show, but the migrant tally picked up a little: alba wagtails and Meadow Pipits trickled over in some numbers, with 2 Kestrels, a Sparrowhawk and a Reed Bunting providing further interest at the Bill; on the ground there was a new Chiffchaff at Blacknor. Sea passage included 22 Brent Geese, 8 Common Scoter and 4 Red-throated Divers off the Bill and 26 Brent Geese and 3 Red-throated Diver off Chesil Cove. Whilst there were welcome hints of passage gathering ground it was hardly a case of the flood-gates opening today. The first minor flurry of 'crests included 2 Firecrests at Avalanche Road and 2 Goldcrests at the Bill, a few Blackbirds and a Chiffchaff were new at the Bill and amongst a small incoming passage of alba wagtails a single White Wagtail made it to Reap Lane. Passage on the sea included 2 Pintails off Chesil Cove and 16 Red-throated Divers, 12 Common Scoter and a Glaucous Gull off the Bill. Among the lingerers still about there were again 2 Iceland Gulls at Chesil Beach/Ferrybridge, 2 Slavonian Grebes off Chesil and singles of Red-necked Grebe and Eider (along with reduced totals of other divers and grebes) in Portland Harbour. Despite not really being able to undestand why we didn't record a Wheatear, it was nonetheless a pleasure to be out on a fine, calm and mild day. The first White Wagtail of the spring was an on-cue arrival at the Bill, where a fly-by Puffin was the first sighting of what we hope is a returning breeding bird; elsewhere, a Mistle Thrush was a first for the year at Southwell, whilst quality came in the form of one or more Iceland Gulls again at Chesil Cove and Ferrybridge (another sighting of a white-winged gull off West Cliffs concerned a bird that was too distant to determine whether it was a wandering Iceland Gull or yesterday's Kumlien's Gull). The back-up cast included a trickle of northbound visible migrants (Meadow Pipits along West Cliffs and 2 Chaffinches over the Bill), the Great Skua again at Ferrybridge, a Black Redstart at the Bill, 2 Red-throated Divers through off the Bill and 19 Black-necked Grebes, 10 Great Northern Divers, 8 Slavonian Grebes, 4 Red-necked Grebes, 2 Black-throated Divers, the Eider and the Black Guillemot in Portland Harbour. 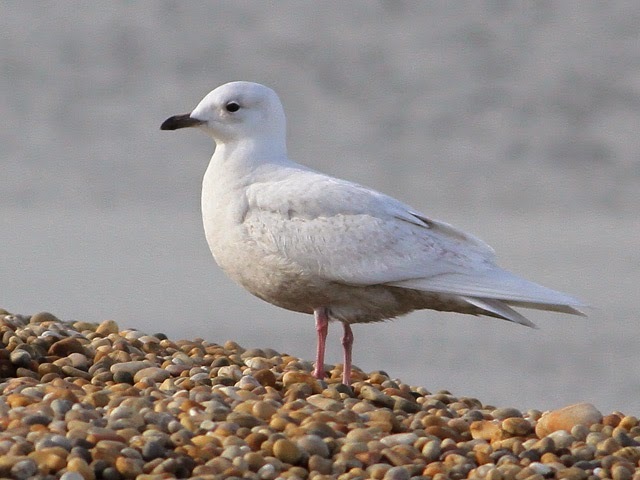 Gulls were back to the fore today, with a welcome prize being a Kumlien's Gull that was first spotted passing through Chesil Cove, before being relocated settled off West Cliffs south of Blacknor Point; one of the Iceland Gulls was also lingering again in Chesil Cove. Early migrant interest was restricted to a handful of Meadow Pipits and Skylarks arriving in/off at the Bill, 39 Dark-bellied Brent Geese and a Red-throated Diver passing through on the sea there and singles of Red-throated Diver and Manx Shearwater through off Chesil Cove. Winterers/long-stayers still making the list included the Firecrest at Suckthumb Quarry, the Great Skua at Ferrybridge and 187 Mediterranean Gulls, 19 Black-necked Grebes, 8 Great Northern Divers, 5 Black-throated Divers, 4 Red-necked Grebes, 2 Slavonian Grebes and singles of Eider and Black Guillemot still in Portland Harbour. As usual at this time of year we're probably getting ahead of ourselves and hoping for more than is realistic. Nonetheless, despite looking promising for the likes of alba wagtails and Meadow Pipits trickling in, migrant-wise today didn't come up with anything of consequence beyond another Contintental Stonechat at the Bill. Movement at sea included 17 Common Scoter, 12 Red-throated Divers, a Great Northern Diver and a Manx Shearwater off the Bill, whilst one of the Iceland Gulls was again at Chesil Cove. What early promise there was today rather quickly evaporated as a freshening wind brought with it thickening cloud and eventually an afternoon and evening of rain. A Continental Stonechat provided interest amongst a little arrival of 5 new Stonechats at the Bill, but the rest of the day's news came from the sea: 2 Iceland Gulls were in Chesil Cove, where Black-headed Gulls and Common Gulls were passing through in some numbers, whilst 33 Common Scoter, 3 Great Northern Divers, 2 Great Crested Grebes, a Red-throated Diver and Black-throated Diver passed through off the Bill. Sadly, dead seabirds continue to be washed up on Chesil Beach: today's haul of 107 between the skatepark and Ferrybridge included 56 Razorbills, 41 Guillemots, 5 Kittiwakes, 2 Puffins and a Manx Shearwater; the majority of these birds were again un-oiled and most were severely underweight. On a lovely mild, sunny day spring was announced in the form of new arrivals/visible passage on land, overhead and at sea, including a Goldcrest at Avalanche Road, 2 alba wagtails in/off and a Rook at the Bill, 42 Common Scoter, 10 Red-throated Divers and a Great Northern Diver through off the Bill and at least 7 Common Buzzards wandering widely overhead. We're beginning to lose track of the white-winged gull tally, but single Iceland Gulls at Chesil Cove and Portland Castle provided today's entertainment for the larophiles. Further interest from perhaps the most fulsome day-list thus far this year came in the form of the likes of 2 Purple Sandpipers and a Black Redstart at the Bill, a Black Redstart at Reap Lane, 3 Slavonian Grebes off Chesil Beach and at least one of the Black Guillemots - along with seemingly dwindling numbers of divers and grebes - in Portland Harbour.